Cosmo and I spent last weekend in Denver at the pet bloggers conference BlogPaws West, and we had a blast meeting fellow bloggers, hobnobbing with sponsors, listening to inspiring speakers and eating our way through the weekend (at least Cosmo did!) 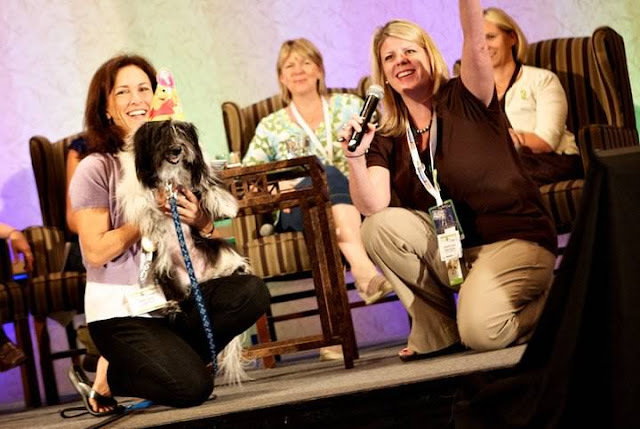 Here's a look at our favorite moments from BlogPaws. The Grand Hyatt Denver made us feel right at home and they treated Cosmo like the king he thinks he is, with an abundance of belly rubs and a new treat or toy every time we returned to our comfy room! Thank you Grand Hyatt! We got to see our old pal Neil Brogan, who generously let Cosmo root around in his bag 'o swag, filled with irresistible treats and toys. 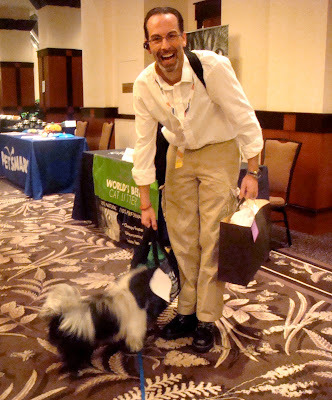 Neil, who pens the wildly popular Life With Dogs blog, was one of 10 bloggers sponsored by Pedigree at BlogPaws West. We were honored to be one of the Pedigree bloggers too and participated in the Write a Post, Help a Dog campaign, which continues through Sept. 19. Cosmo got lots of playtime with his pal Laura Zickus, mom to his BFF @Perrythebirman! Chica Boom! The swag provided hours of tugging and playing fun including the giant plush gator from Kyjen. Cosmo and his new pal Dexter, dog to Carol Bryant at Fido Friendly posed solemnly in front of the interactive piece of art -- "Hand to Hand, Paw to Paw" -- created by BZTAT live at BlogPaws! 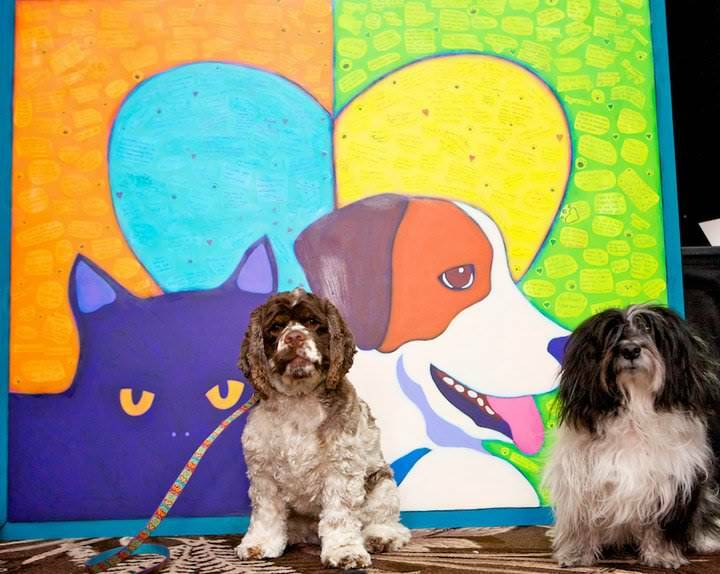 During the conference, each BlogPaws attendee penned their own thoughts and ideas that were incorporated into the artwork. Cosmo might not enjoy the party hat he so graciously tolerated, but the doggie birthday cake presented to him by BlogPaws co-founder Caroline Golon, right, more than made up for the humiliation. Thanks to Brett Chisholm of Houston Dog Blog for sending us this photo and for the camera tips! 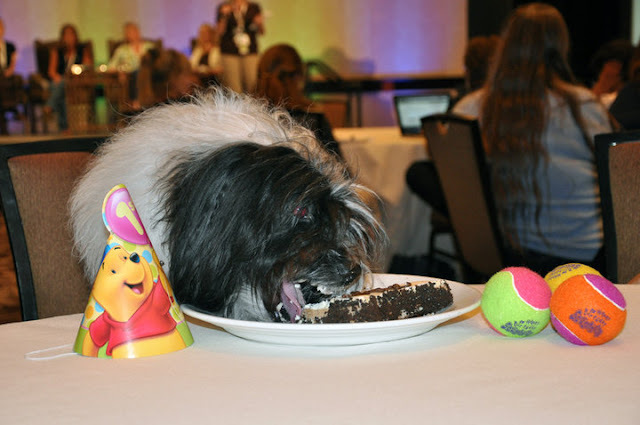 Cosmo thoroughly enjoyed eating his way through his eighth birthday at BlogPaws. I was a bit worried he'd be over the weight limit for the plane ride home, but it all worked out! Thanks to Boris Kitty for sending us this photo, and thanks to everyone for spoiling this little doggie more than he already is! Inspiring sessions included this panel discussion from the Be the Change Panel of Jane Harrell, Dorian Wagner, Lynn Haigh and Jessica Vogelsang. Twelve-year-old Miah Thornton, standing, wowed the audience with her new blog, Start the Change. 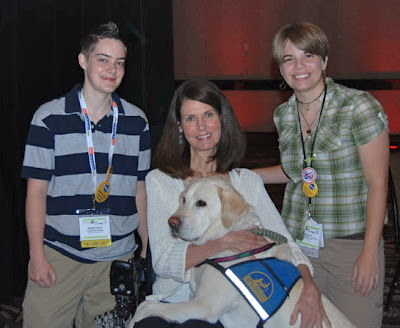 In another session that inspired, Randi Price told the story about her partnership with CCI service dog Lucky. Here, Ashley Niels and Nikki Jeske of Pettie Award winning blog I Love Rescue Animals had the chance to chat with Randi and Lucky. We met the most amazing group of people and pets at BlogPaws! See you next year!! Cosmo and you and everyone else look like they had an amazing time! What a great conference! Next year I am so coming! Happy belated birthday Cosmo! What a great conference - it was wonderful to see you and Cosmo again! ومهما طال الوقت عليكم تذكروا طول الوقت ان مؤسسة نقل اثاث من المملكة السعودية الي الامارات هي المؤسسة التي تناسبكم و تناسب امكانياتك في اي وقت جائز ، اتصلوا بنا هذه اللّحظة ولا تترددوا نهائيا من التسبب في أي إشكالية مهما كانت ، اتصلوا بنا و كونوا على الميعاد .